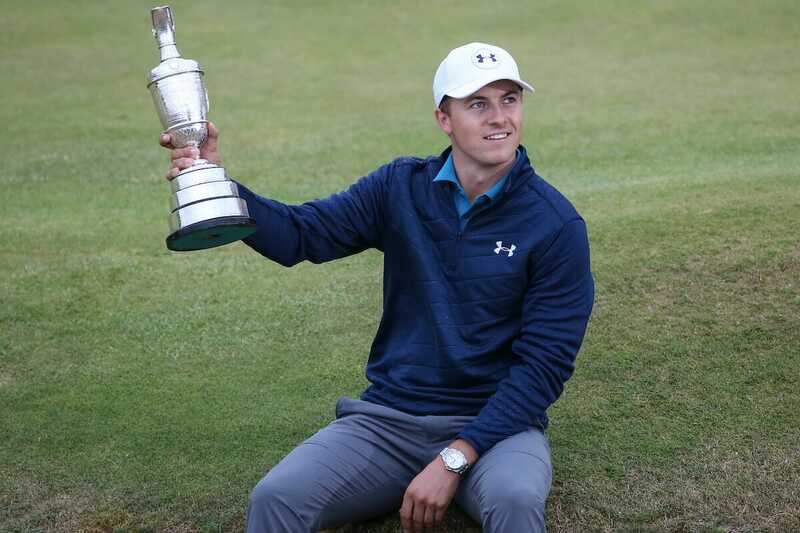 In claiming the Claret Jug for the first time, Jordan Spieth moved to within one win of a grand slam of major championships and, at the age of 23, now has the Masters Tournament, the US Open and The Open crowns to his name. Next up: the US PGA Championship in August. Only Jack Nicklaus has been quicker to win three of golf’s most coveted titles. Whereas Nicklaus achieved the feat in his 16th major, Spieth was playing here in his 19th. Tiger Woods took one more. As he will be only too aware, Spieth is in exalted company. Spieth had a final round of 69 for a 12-under-par total of 268 and victory by three strokes over Matt Kuchar, his fellow American, who also had a 69. With five holes to go the eventual Champion Golfer of the Year found himself trailing for the first time and was stung into action. After dropping a shot at the 13th, he proceeded to birdie the par three 14th, where he almost had a hole in one, ran in a putt of around 40 feet at the 15th for an eagle, birdied the 16th from around 20 feet, and rolled in another good putt for a birdie at the 17th. It was golf that belied what had gone before and was the stuff of legend. From the moment he missed the fairway and then bogeyed the first hole, Spieth was on the back foot. Many seasoned observers had assumed he would stroll away with the Claret Jug so long as he kept Kuchar at arm’s length. Spieth started the final round with a lead of three strokes over Kuchar and six over Brooks Koepka and Austin Connelly. All he needed to do, surely, was play the way he had over the previous three rounds – when he had scores of 65, 69 and 65 – and The Open crown would be his. Golf, however, is rarely that simple. Three bogeys in the first four holes – primarily because a normally assured putting stroke had deserted him – brought Spieth back to the field. Both he and Kuchar would have been fully aware that Haotong Li, of China, had set the clubhouse lead on six under par and would have known they could not afford to let slip. By the turn Kuchar had made up the deficit. Neither player was playing with the assurance of the previous three days, but Kuchar’s level-par outward half of 34 in difficult crosswinds was certainly the steadier of the two. And when Kuchar took the lead for the first time at the 13th – when his playing partner drove into the dunes and was forced to take a penalty drop which he played from the practice ground 120 yards to the right of the fairway – it looked as if Spieth may finally have surrendered The Open to his friend and rival. A bogey there to Kuchar’s rock-solid par – he had waited almost 20 minutes to take his putt – meant the lead changed hands for the first time. With five holes to go, Kuchar led Spieth by one and Li by two. And then Spieth came to life. When The Open was last played at Birkdale, Spieth attended as a spectator, having finished second in Junior Open at Hesketh. Now, nine years later, he was to be seen lifting the iconic Claret Jug. What a win. What a champion.